You are not logged in. [Log In] Weatherzone » Forums » Archives » Climate and Climate Change » ENSO Discussion 2012. Here is a further update of my experimental very different input data Nino 3.4 model forecast for info...has done very well so far! I would say extremely low. Our winter is the usual time the ENSO begins setting up, by September it starts to get cranking, by Xmas or early january its peaked. Think you will find Nathaniel that we will indeed see a cooling off with renewed trades strengthening as the South pacific convergence zone moves west. However i dont think it will reach La nina status, will remain neutral IMO, due to the timing being out as Johnno mentioned. Note that in my post I said that I expect a sharp switch to [/i]La Nina territory[i], by which I meant that I think that ENSO indicators will rapidly begin to look more like La Nina, not that an actual La Nina will develop by December/January (as would be impossible given the definition of ENSO events being based on sustained values over at least a 3 month mean). I said that I expect a moderate La Nina to develop during 2013. I do understand that it is unlikely, there is no debating that, and for the longest time I have gone with neutral values through until at least February, however, I now believe that there will be a more rapid switch. I stand to be corrected by actual events as they unfold, however, and I will be more than happy to admit that I was wrong if it turns out that I am. I wouldn't be surprised if there is a nina next year given the massive fight this attempted nino has been battling. Despite all the obvious sugns that a nino was on the way something (PDO?) has smashed it at every attempt. Further to ColdFront's post, have a look at this picture. 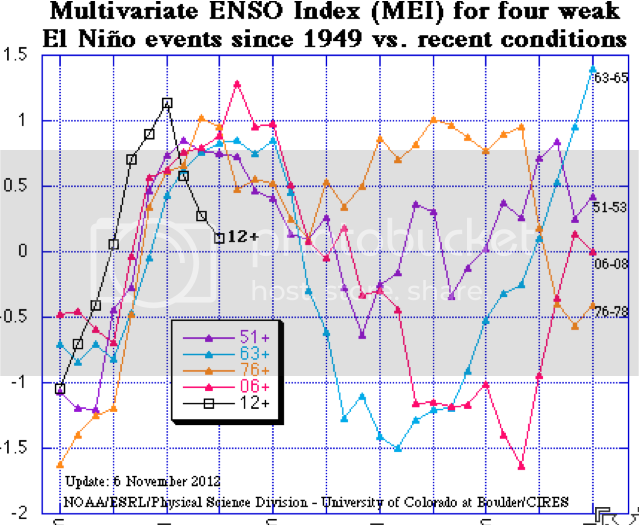 Four weak Nino's, 2 of them in a cold PDO, one in a neutral PDO, and the response to the 3 year 74 la nina. None of them weakened so quickly, i think we are seeing a message that this cold PDO could be a strong one. In a cold PDO, you do expect weak Nino's, possibly moderate but very rare or likely. But as CF said, this was gutted in quick time. Something is up. AV. I have read myself that a neg PDO brings 75% La Ninas. I haven't got a link to where l read that. But tonight l thought l would check that ratio myself. The overall impact was strong with most of the northern two-thirds of the country recording below to very much below average rainfall. For the 12 months from March 1951 to February 1952 (Figure 1), rainfall totals were in decile 1 over nearly all of Queensland, the northern half of the NT, as well as scattered parts of northern NSW, SA and WA. Large areas in northern Queensland and the NT had record low falls for this particular 12-month period. Rainfall was average to above average in Victoria and southern SA, particularly between April and August (Figure 2) when 5-month totals were in decile 10 or the highest on record. The overall impact was moderate. Over the 9-month period from March to November 1965 (Figure 1), rainfall was below average across most of NSW and SA, the southern half of Queensland, southern NT and patches in both Victoria and Tasmania. The most seriously affected region was a large area straddling the NSW/Queensland border stretching from near Longreach in the north to Dubbo in the south. Totals here were in decile 1 for the nine months with a few patches of lowest on record. Above average totals occurred in August over SA and southern NSW, but it wasn't until December 1965 that some relief came for the worst affected area with above to very much above average falls. However, the relief was short-lived as conditions were generally drier than average right up until July 1966 causing a large part of NSW and southern Queensland to be in decile 1 for the 17 months (March 1965 to July 1966), Figure 2. This was depsite a rise in the SOI and a return to neutral Pacific sea-surface temperatures, thus suggesting a mechanism apart from El Niño. The overall impact was moderate to strong with most of the southern half of the continent being drier than average, including extensive parts of NSW, SA and WA that were in decile 1 for the nine months from March to November 1957 (Figure 1). Parts of central NSW and WA registered their lowest rainfall on record for this 9-month period. May and the spring months were particularly dry, but falls were more patchy in winter with some above average regions in NSW and Victoria. Tasmania and western Victoria though, were drier than average in winter with record low falls in the Apple-Isle. THe best so far is BILLS recent post of the trade wind anomalies. I would like to see if l can find time series of the equatorial trade wind anomalies.. Statistically Smoothed to see the oscillation pattern.? Note: The ENSO years l have marked may not be official years as there seems to be a range of ways of identifying an enso event.. I may not have marked ALL the enso events. A few weaker events may be missing and some events in the early 1900's l have omitted . the ten year long drought from 2001 to 2010 was caused by a weak El Nino in 2002/2003, it's illogical to assume that we won't see El Nino again, there will always be El Ninos regardless of PDO, other factors like volcanic eruptions also influence El Ninos, the long El Nino event in the early 1990s probably had help from Mt Pinatubo. I have used the wind anomaly time series from this fabulous link! We are currently still in La Nina thresholds according to the map below. All eyes on the trade index!! for November/December.!! Is it unusual for the trades to change or weaken at this late stage of the cycle? What is the current trade wind index for the south west pacific( 135E -180)? for Nov 2012? After plotting the BOM data onto the wind anomaly graph. and the graph below shows the waxing and waning!! After ploting the BOM enso event records there were a few peaks and troughs on the wind anomlay chartt hat were not found in BOMs Enso event records . So l used ONI ( sst's) to check the status and found indeed ALL peaks and troughs correspond to enso events. All La nina events correspond with a positive standard deviation and ALL El Nino events correspond with negative standard deviation. for the south west equatorial trade winds . 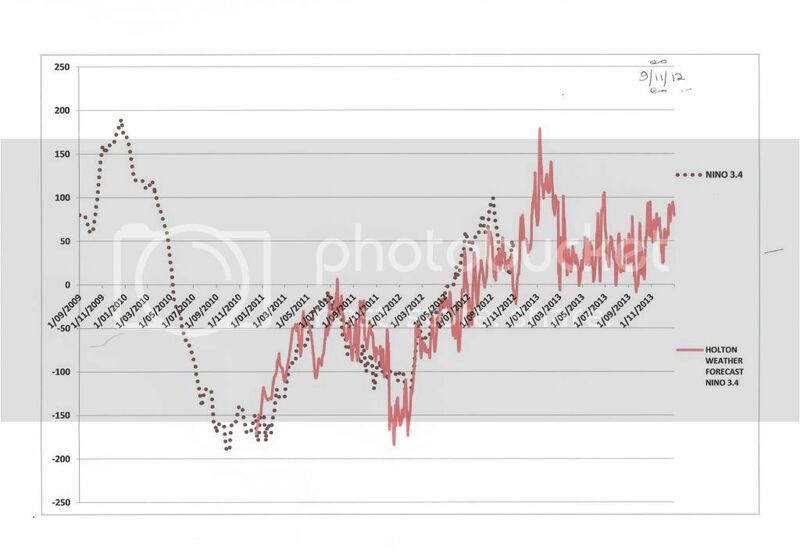 Is it possible to accurately predict the trades and hence an Enso event well in advance..? The amplitude of the wind anomaly is not a reliable indicator of strength. I suspect the strength of the event comes from another variable? Here is a report by BOM regarding that period. The correlation is incredibly good!! BD: Re solar.. and ENSO. Is there any evidence that a down turn in solar activity affects the equatorial winds? Re Crikey your question: I have not looked at the equatorial wind side of it, but Solar downturn affects ENSO-S0I-nino3.4, etc, so one would assume so as all these things are closely connected. Other than the ... http://www.holtonweather.com/DROUGHTRESEARCHPAPERMay2012PTLJC7.pdf paper, I have not really time to do any such research into it atm. Thanks BD. I will keep an eye out . Looking for a cycle in the south west pacific trade winds . I considered the scenario below which suggests a possible biennial ( 2 yr) cycle. I have marked the proposal with green lines. That would infer the trade winds basic oscillation is partly related to the suns zenith position and /or? However there is some thing curious here. When the trades break from the biennial oscillation.. a distinct La nina phase emerges!!! into the opposite of the expected anomaly, you have basically found what initiates a la Nina.!! The south west pacific trades broke pattern between 1998 -2002 ( 4 yrs) and between 2008 and 2011? So what happened during those years to alter the biennial trade wind pattern. They use General circulation models ( GCM's)and confirm with live'data. Bill, drawing on the above, have you seen anything on ENSO and the QBO? The QBO is certainly an interesting phenomenon (and hard to explain) and it does have some tie-in to the ENSO. Its just that I can't see what it is or what it does or how it works (I usually want to have a physical explanation before looking at climate data). Thanks Bill - I think I looked at it some time in the past and fiddled with it and got nothing. Maybe it reinforces and mutes phases. crikey? How does then QBO [Quasi Biennial Oscilation] tally with what you looked at above? We have shown in several publications that there exists a strong signal of the 11-year sunspot cycle throughout the year, but this signal can only be identified, if the data are stratified according to the phase of the QBO (Labitzke, 1987; 2002, 2003; Labitzke and van Loon, 1988, 2000; van Loon and Labitzke, 1994, 2000). The 11-year sunspot cycle is connected with a large variability of the solar radiation in the ultraviolet (UV) part of the spectrum which varies about 6-8% between solar maxima and minima (Chandra and McPeters, 1994). That is enough to cause in the upper stratosphere changes in the temperatures, winds and ozone which will result in circulation changes here and it is possible that such changes have an indirect effect on the lower stratosphere and on the troposphere. Different observations indicate that the mean meridional circulation systems, like the Brewer-Dobson Circulation (BDC) and the Hadley Circulation (HC) are influenced by the 11-year solar cycle (Kodera and Kuroda, 2002; Hood and Soukharev, 2003; Labitzke, 2003, 2004a, b; Salby and Callaghan, 2004; van Loon and Meehl, 2004). Recent simulations of the middle atmosphere, using General Circulation Models (GCMs) and introducing the changes in UV and ozone and profiles of the winds over the equator, simulating the east and west phase of the QBO, respectively, resulted in a realistic simulation of the variability of the arctic polar vortex in northern winters (e.g., Matthes et al., 2004). The simulated signal over the tropics is, however, still too weak." A statistical analysis of 51 years of NCEP–NCAR reanalysis data is conducted to isolate the separate effects of the 11-yr solar cycle (SC) and the equatorial quasi-biennial oscillation (QBO) on the Northern Hemisphere (NH) stratosphere in late winter (February–March). In a four-group [SC maximum (SC-max) versus minimum (SC-min) and east-phase versus west-phase QBO] linear discriminant analysis, the state of the westerly phase QBO (wQBO) during SC-min emerges as a distinct least-perturbed (and coldest) state of the stratospheric polar vortex, statistically well separated from the other perturbed states. Relative to this least-perturbed state, the SC-max and easterly QBO (eQBO) each independently provides perturbation and warming as does the combined perturbation of the SC-max–eQBO. All of these results (except the eQBO perturbation) are significant at the 95% confidence level as confirmed by Monte Carlo tests; the eQBO perturbation is marginally significant at the 90% level. This observational result suggests a conceptual change in understanding the interaction between solar cycle and QBO influences: while previous results imply a more substantial interaction, even to the extent that the warming due to SC-max is reversed to cooling by the eQBO, results suggest that the SC-max and eQBO separately warm the polar stratosphere from the least-perturbed state. While previous authors emphasize the importance of segregating the data according to the phase of the QBO, here the same polar warming by the solar cycle is found regardless of the phase of the QBO. The polar temperature is positively correlated with the SC, with a statistically significant zonal mean warming of approximately 4.6 K in the 10–50-hPa layer in the mean and 7.2 K from peak to peak. This magnitude of the warming in winter is too large to be explainable by UV radiation alone. The evidence seems to suggest that the polar warming in NH late winter during SC-max is due to the occurrence of sudden stratospheric warmings (SSWs), as noted previously by other authors. 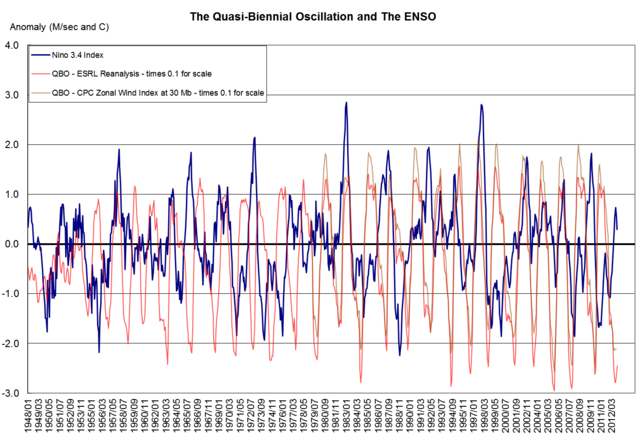 This hypothesis is circumstantially substantiated here by the similarity between the meridional pattern and timing of the warming and cooling observed during the SC-max and the known pattern and timing of SSWs, which has the form of large warming over the pole and small cooling over the midlatitudes during mid- and late winter. The eQBO is also known to precondition the polar vortex for the onset of SSWs, and it has been pointed out by previous authors that SSWs can occur during eQBO at all stages of the solar cycle. The additional perturbation due to SC-max does not double the frequency of occurrence of SSWs induced by the eQBO. This explains why the SC-max/eQBO years are not statistically warmer than either the SC-max/wQBO or SC minimum/eQBO years. The difference between two perturbed (warm) states (e.g., SC-max/eQBO versus SC-min/eQBO or SC-max/eQBO versus SC-max/wQBO), is small (about 0.3–0.4 K) and not statistically significant. It is this small difference between perturbed states, both warmer than the least-perturbed state, that in the past has been interpreted either as a reversal of SC-induced warming or as a reversal of QBO-induced warming. Received: August 31, 2005; Accepted: July 24, 2006"
There have been several observational and modeling analyses that have indicated that the stratospheric quasi-biennial oscillation (QBO) significantly affects the tropical troposphere. This article aims to identify the QBO signal in tropical deep convection. Some difficulties in previous studies were ambiguities in the identification of tropical deep convection in observations, and also in separating the El Niño/Southern Oscillation (ENSO) and other tropospheric signals from QBO influences. We use a recent cluster analysis of 21.5 years of International Satellite Cloud Climatology Project tropical weather states to identify tropical deep convection and cirrus clouds, as well as 32.25 years of precipitation data as proxies for deep convection. Correlations between the QBO, ENSO, and other tropospheric patterns such as the tropospheric biennial oscillation and Pacific decadal oscillation are taken into account to isolate the influence of the QBO. Whereas tropical deep convection is mostly related to ENSO and the annual cycle, the QBO westerly phase, independent of the annual cycle as well as linear and nonlinear impacts of ENSO, leads to an eastward shift in the strength of meridional overturning contributions to the Hadley circulation over the Pacific and thus also affects the subtropical circulation. For deep convective clouds, relative differences in convective cloud cover between the QBO easterly and QBO westerly phases can be as large as 51% ± 7% of the annual average over isolated regions in the tropical west Pacific and 103% ± 35% over the east Pacific, where the absolute values are lower and where notable deviations occur during the QBO westerly phase. Summary: The El Nino-Southern Oscillation (ENSO) and the stratospheric Quasi Biennial Oscillation (QBO) are major sources of interannual tropical variability, and are also known to generate teleconnections between the tropics and extratropics. However, their effects in the stratosphere are hard to separate in the analysis of observational data and realistic simulations. Recent papers have shown a non-linear stratospheric response when they combine (e.g. Calvo et al. 2009) and also in some cases, the influence of these stratospheric signals in the troposphere (e.g. Cagnazzo and Manzini 2009). This DynVar Research Topic focuses on characterizing the ENSO and QBO signals and their combined effects in the stratosphere; and also on investigating the possible role of the stratosphere on tropospheric ENSO and QBO teleconnections. This PDF paper(if U can fathom it out!~) seems to indicate a 20month QBO cycle...Crikey 2 year cycle observation...close! What affects does -/+QBO have on Australia? I have been reading in to QBO this last couple of days and it is certainly interesting reading. I have yet to come up with a real lot, except to say that there is a link between tropical cyclone frequency and intensity with the QBO status. Apparently research has shown that in negative period the frequency is slightly higher but intensity is likely to be reduced, while a positive QBO is likely to see lower frequency but higher intensity storms. I am in the process of looking for links between 50hPa zonal wind anomalies and ENSO at the moment, and would also appreciate some input from anybody who has done significant reading on the subject. Generated in 0.038 seconds in which 0.022 seconds were spent on a total of 14 queries. Zlib compression disabled.